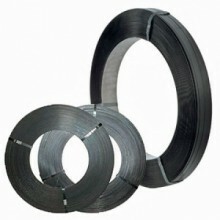 For heavy packages or sharp-edged packages, steel strapping is an extremely suitable packaging method. Uniflex from Cyklop is available in European winding format (± 25 kg) and American winding format (± 50 kg) in various widths, thicknesses and surface finishes. Cyklop Superflex steel strapping is made specially for heavier applications, being characterised by a very high breaking strength and elasticity.